Read all of these this week, even though it has been a rough week. Lost Czar, the angry grey cat, last Tuesday and then had a rough week at work, enough to make me want to climb into bed and pull the covers over my head. Anyway, adopted a new rescue kitty this week so things are looking brighter. 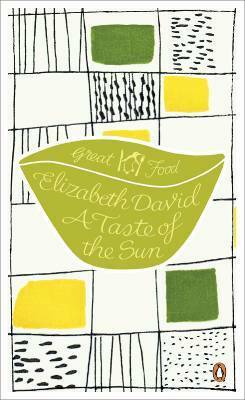 A Taste of the Sun by Elizabeth David is one of the Penguin Books’ Great Food releases, which I received for Christmas and have been enjoying reading off and on. This is a top quality foodie read packed with history and interesting recipes from a writer who brought French and Italian influences to British cooking. The recipes are easy to follow and still relevant today such as recipes for Ragu, Bolognese and Tian. The sections are varied and make for interesting reading as one finds chapters devoted to picnics, wine in the kitchen, potted meats and fish and even toast. A great read for those interested in food writing and food history. 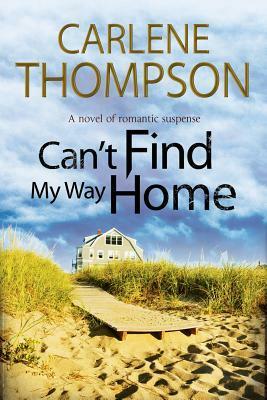 Can’t Find My Way Home by Carlene Thompson is a thriller that is based upon an 18 year old “solved” crime involving the protagonist, Brynn’s father. Her brother has always been convinced of their father’s innocence and on a mission to uncover new evidence he disappears this brings Brynn back to the scene of the crime, exactly where she never wanted to be. There are twists and turns here, but although I can’t point to any specific clues I solved this relatively early on. Still it was an engaging read, well paced and it even was satisfying to discover my guess was correct in the end. The cover blurb read, ” Mary Higgens Clark fans, take note” and that felt fairly accurate to me. The novel does read much like Ms. Clark’s books. Kill ‘Em With Cayenne by Gail Oust is the second book in the A Spice Shop Mystery Series. In this book, Piper continues to struggle with her business and her teenage daughter, her ex is planning his wedding, and two romantic opportunities compete for her attention. Becca is not well liked and especially by Maybelle, one of Piper’s customers and friends and when Becca turns up dead, the police look to Maybelle as their number one suspect. Piper ups her sleuthing game to prove Maybelle is innocent. A BBQ festival in town widens the pool of suspects for the murder. A fun mystery read for cozy fans. 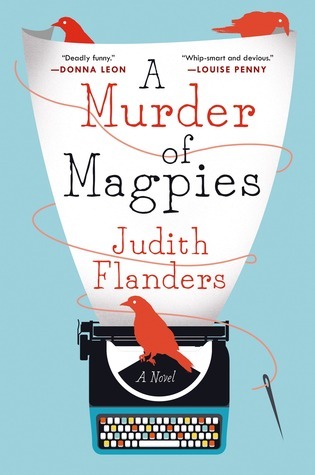 A Murder of Magpies by Judith Flanders was an impulse checkout at the library. The cover caught my eye and I added it to my pile. THis was not quite a cozy mystery but I don’t exactly know where else to categorize it. There was a lot of humor primarily aimed at the publishing industry as the protagonist is an editor and the mystery surrounds a book she is to publish by a friend of hers. Turns out that it is a piece of investigative journalism that some people do not want published. The author goes missing and Sam uses her intelligence and her contacts to investigate with considerable help from others among them, her mother, an attorney of considerable talent. The money laundering plot line is somewhat convoluted but I guess that is the point of money laundering. Several strong female characters and the characters in general are well drawn and fully fleshed out. A very good mystery with humor along for the ride. Sometimes impulse checkouts at the library turn out very well. I have certainly found some new favorite authors that way.